This is a work in progress as it has turned out to be far more complicated than I thought it would be! 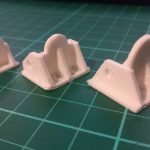 I’ve learned a lot about how to design parts for my 3d printer and how to use the laser cutter at Reading Hackspace too though so already winning! 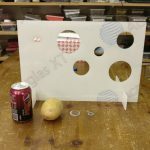 The size of the backboard and targets with a can of coke, potato and pennies for scale. 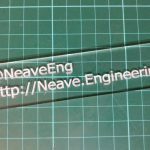 To test the cutter, a nameplate! Left to right, prototype hinges. The final design was the fourth! The mess of wires before it was simplified and the old hinges. 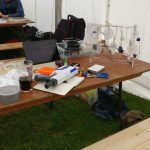 Over the passed few years my friends in the Reading Beer Festival Games Team have been talking about building a shooting gallery using Nerf guns to keep things nice and safe. This year I offered to give it a go and the spec quickly escalated/became more fun! As I’m building this more for the team than the players it needs to be easy for them to use while dealing with the festival punters who are typically moderately inebriated… Resetting the board easily, keeping track of the score and setting up for the next game seems like the three things to concentrate on. Having a bunch of clips that have 12 darts and a button that resets the game means resetting should be a lot easier than having to do it manually so that’s easy win, enter the Arduino! 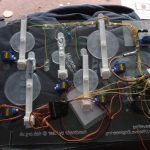 I bought a bunch of hobby servos of eBay to use to reset the targets and designed a hinge with a magnet to hold up the target and a switch of some kind to track when a target is hit. I’ve got a design working for the hinge but need to replicate it for all five targets. More details once it’s complete but here’s an incredibly satisfying video of the mechanism in action!